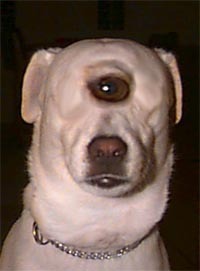 The initial failure of this effort to create a better Seeing Eye Dog is a result of the genetic engineers' literal mind. Had they been told to breed a better 'Seeing Eyes Dog' the outcome may have been far different. The modified breed lacks depth perception, so Beta testers experienced lackluster performance. An attempt to rehabilitate the subject dogs as 'Frisbee Dogs' has also failed. With extremely acute sight in the one eye, these dogs can read and watch TV. They prefer television, especially "When Animals Attack".